The map of terrorist and extremist groups in Libya is being redrawn, six years after the fall of the Gadhafi regime after the Ansar al-Sharia group linked announced that it was formally dissolving itself. The al-Qaeda-linked group said in a statement on Saturday that its decision came on the back of heavy losses that have wiped out its leadership and decimated its fighters. Groups such as Ansar al-Sharia, which had tried to maintain a stronghold in the country’s east, have inserted themselves into the larger war, creating a fractious battleground overlaid by a multitude of militias. The group, which Washington says was behind the 2012 Benghazi attack that killed the US ambassador Christopher Stevens, had been at war with Khalifa Haftar’s eastern-based Libyan National Army. The group’s statement called on revolutionary forces and shura councils in Benghazi to unite in order to form a united front. Haftar earlier this month launched an offensive to oust extremist fighters from their two remaining strongholds in Benghazi. 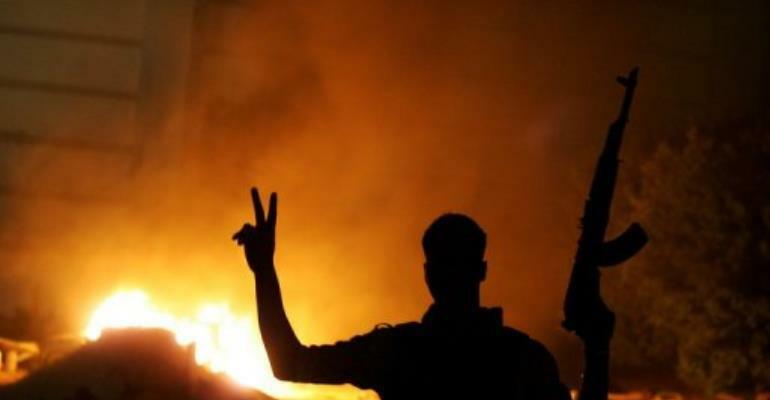 The group lost its leader, Mohammed Azahawi, in clashes with Haftar’s forces in Benghazi at the end of 2014. Most of its members then defected to ISISI. Ansar al-Sharia later joined the Revolutionary Shura Council of Benghazi, a local alliance of extremist militias. At its zenith, Ansar al-Sharia was present in Benghazi and Derna in eastern Syria, with offshoots in Sirte and Sabratha, western Libya. The organization took over barracks and other sites abandoned by the ousted Gadhafi forces and transformed them into training grounds for hundreds of extremists seeking to head to Iraq or Syria.